Anthony J Stephens hit the ground running when in 1960 as a teenager he captured the New Zealand Open Championship, The New Zealand Handicap Singles, The Men’s Open Championship and the New Zealand Championship doubles with his mentor Ashley (ADJ) Heenan. A true grand slam – all 4 titles at the same tournament – and at the age of 16. (Tony was the third player to have achieved this feat, Clem Watkins having done so in 1954 and Ashley Heenan in 1958.) Tony was a member of the 1963 and 1996 MacRobertson Shield Teams. Tony became a dairy farmer in Dannevirke and played with his parents and sister at the Rangatira club. The playing family extends to Tony’s wife Colleen and daughters Sonya and Erica. In his youth Tony was also a pole vaulter, and a decathalete after which he was a billiards champion. He has had a low profile over the years. However, in 1994 he won the Heenan Plate at the NZ National championships and followed this achievement by winning the USA Open champion ship and the Championship Doubles. In 1998 he won the NZ President’s Invitation Event First Eight. 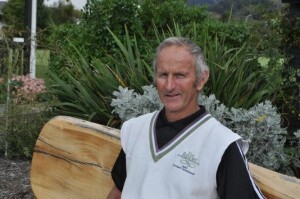 In 2009 Tony again won the New Zealand Men’s Championship – 50 years after his first success. Tony has moved his primary focus to Golf Croquet although he still plays a great Association game. He now lives in Havelock North and is an orchardist.